Customers who have graciously send photos of their new purchase(s) installed in their homes. Courtesy: M Short, VA Fan: CXL52FB - Flat Black w/Rustic Country Trim & Reversible HVD Black Old Mustard/Medium Oak Blades. Light Kit: WF12/5 HVD Black Olde Mustard w/Black Trim. 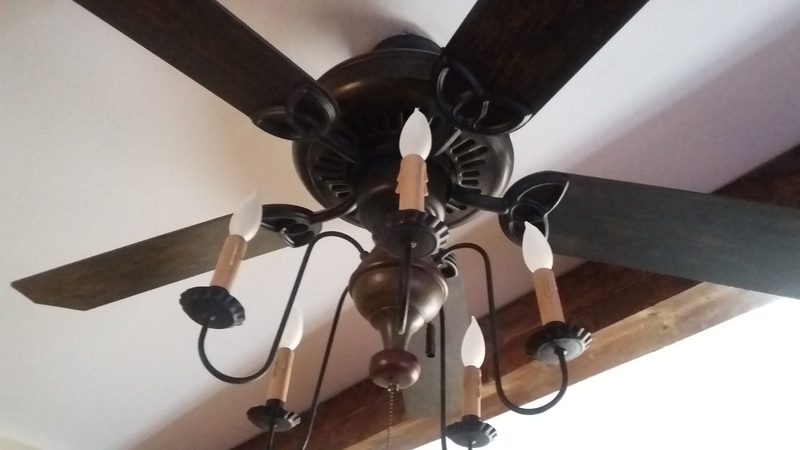 Courtesy: A Dejesus, NY Fan: AT52HVD Black Housing, w/Rustic Country Trim & Reversible HVD Black Old Mustard/Medium Oak Blades. Light Kit: WF12/5 HVD Black Olde Mustard w/Cranberry Trim.